"I thought it must be the fairest picture the whole earth affords." So said Mark Twain about Lake Tahoe. The native Washoe Indians referred to it as "big sky lake." Lake Tahoe is best known for its beautiful blue and clear water (99% pure), and is surrounded by mountains which rise more than 4,000 feet above the shore. 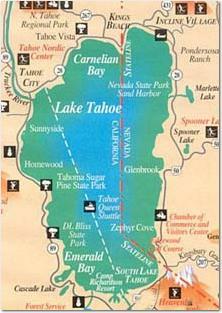 The lake is 22 miles long, 12 miles wide; about one-third lies in Nevada, the rest in California. The water drains from Lake Tahoe through the Truckee River which is one of a few rivers that run inland to the desert rather than towards the ocean. Lake Tahoe is the third deepest lake in North America as it has an average depth of 989 feet, but the deepest point is about 1,645 feet. Annual snowfall averages 40 feet, with snowpack averaging 20 feet. This explains why downhill and cross-country skiing are very popular in the winter. Summer activities include hiking, white water rafting, beach pinics and other water activities. Go directly to the Lake Tahoe Photo Gallery. Early in December 1999, while in Reno, Nevada for a professional conference, North Carolina Bro had the opportunity to spend some time enjoying the stunning wonder that is Lake Tahoe. High in the Sierra Nevada Mountains, skirting the border with California, this vacationer's paradise is arguably one of the most beautiful places on Earth. Lake Tahoe has 72 miles of shoreline and is the fifth deepest lake in the world by average depth. As evidenced by the pictures you will see in this gallery; this lake is blue, really blue. Generally, the deeper a lake is, the bluer it looks. It can also appear red during sunsets, or gray-black during storms. A short 45 minute drive from Reno over Mt. Rose, the area offers recreation for any time of year. From world class ski resorts to boating and championship golf, year-round activities make this area a mecca for outdoor enthusiasts. Gambling is legal on the Nevada side of Lake Tahoe. Casinos, each with a variety of slot machines and table games, are located on the South Shore in Stateline, and on the North Shore in Crystal Bay and Incline Village. Although it is commonly believed that Lake Tahoe was formed by the collapse of a volcanic crater, the basin was actually formed by the rise and fall of the landscape due to faulting. The water in Lake Tahoe is very cold, staying at a constant 39° F. below 600 feet. Shallow areas along the shore can warm up to 68° F. during the summer months. Lake Tahoe's tremendous depth and volume is always in motion. This has kept the lake from ever freezing over, though some protected inlets like Emerald Bay have been covered with a layer of ice. Lake Tahoe is so clear in some places that objects can be seen to depths of 75 feet. Most of the precipitation that falls in the basin drains through marshes and meadows, which are good filtering systems for water. For fourteen seasons in the 1950s and 60s, fans watched the adventures of Pa, Adam, Hoss and Little Joe on the television program Bonanza. The fictional Cartwright family lived on the Ponderosa Ranch at Lake Tahoe, and parts of Bonanza were filmed on its shores. The famous opening scene of Bonanza was filmed on location at North Lake Tahoe near Incline Village, and Lake Tahoe was among the outdoor locations used to film the weekly episodes. Join us on this photographic tour around the eastern, Nevada side of beautiful Lake Tahoe. There was snow in the mountains the night before NC Bro was there, so the trees were a winter wonderland, but the weather cooperated perfectly on this day.